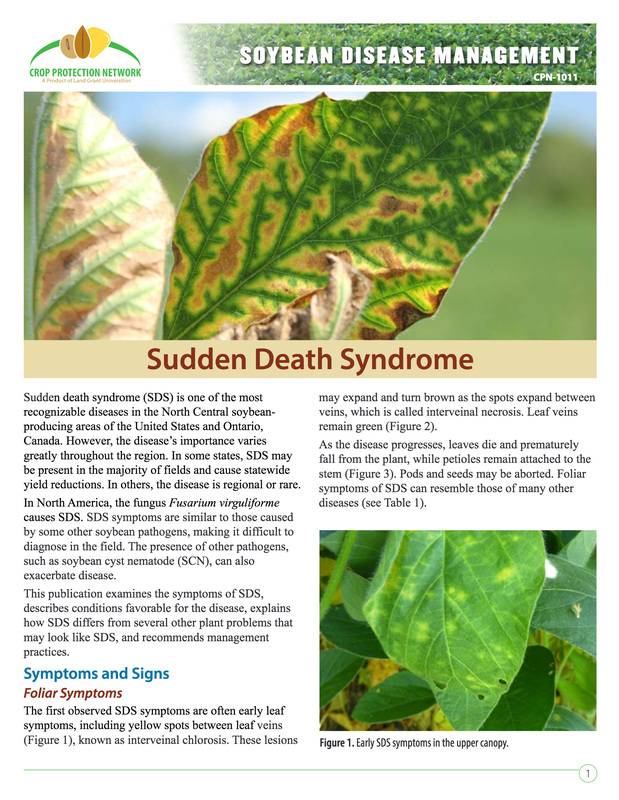 Soybean sudden death syndrome (SDS) has become one of the leading soybean diseases in North America to reduce yield. 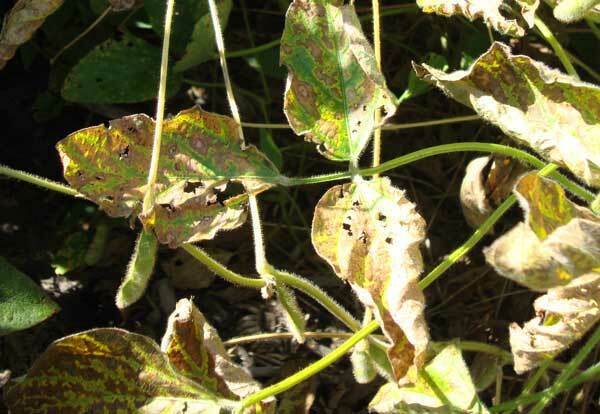 SDS has two phases–a root rot phase and a leaf scorch phase. The sudden death syndrome fungus (Fusarium virguliforme) survives the winter as spores in crop residue and soil. Early in the season, the fungus infects and grows in soybean roots. Infection and colonization are favored by cool, wet soil conditions. The SDS fungus produces toxins in soybean roots that are transported to leaves. As a result, interveinal yellow and brown blotches appear on the leaves, typically after flowering. 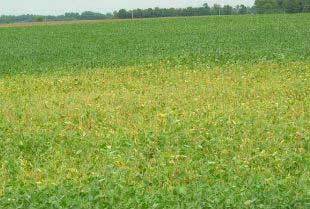 Foliar symptoms are more severe after frequent or heavy midseason rains. Diagnosing SDS can be challenging, because other diseases and disorders cause symptoms similar to SDS. See Table 1 (page 6) in Sudden Death Syndrome (2016). 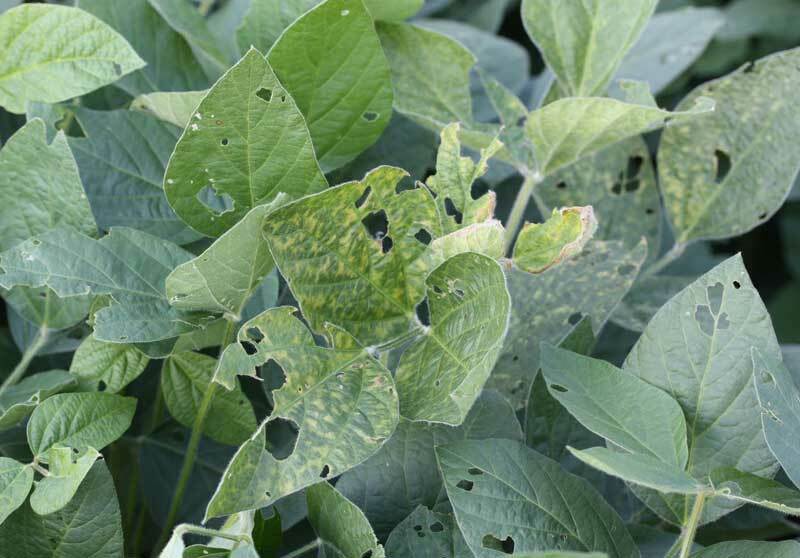 Foliar symptoms alone are not enough to diagnose SDS. It is important to inspect plants closely, dig and inspect roots, and split soybean stems open. After splitting stems, the pith of a plant infected with SDS will be white even if roots are severely rotted. The cortex may have brown to gray discoloration. 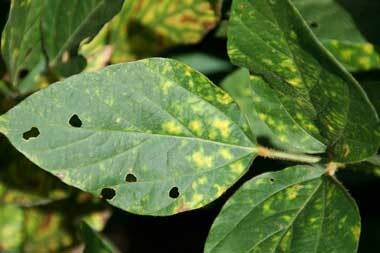 You may also need a laboratory diagnosis to distinguish SDS from other soybean diseases and disorders. Watch for foliar symptoms. Foliar symptoms can appear early but most often are visible after flowering. The first symptoms to appear are yellow blotches between the veins that progress to large irregular patches. The vein tissue remains green. Split the stems. If the center of the stem is brown, it is BSR; if white, it is SDS. Dig up roots. SDS causes root rot, while root systems of plants affected by BSR remain healthy. Plants infected with the SDS pathogen are easily pulled out of the ground because the taproots and lateral rots have deteriorated. While not always present, a bluish color to the roots (fungal spores) is diagnostic for SDS. SDS symptoms appear earlier than BSR. Be aware that stem canker is not as common as SDS. Stem canker can occur in the same year and fields as SDS. In addition to foliar symptoms, stem canker will often have cankers on the lower stem, and defoliation is not as pronounced as with SDS. Late-season foliar symptoms of SDS. As the disease progresses, the areas between the leaf veins will turn bright yellow, then eventually brown. The dead, brown tissue between veins may die and fall out, leaving large ragged holes and streaks in leaves. Symptoms are generally more pronounced on top leaves. Flowers and pods may abort or not fill. A key symptom of SDS is substantial amounts of root rot and discoloration of roots and crown. Diseased plants are easily pulled out of the ground because of decayed lateral roots and taproots. When split lengthwise with a knife, the internal tissue of the main or tap root will be gray to reddish brown, not healthy white. SDS is diagnosed by the symptoms on both leaves and roots. 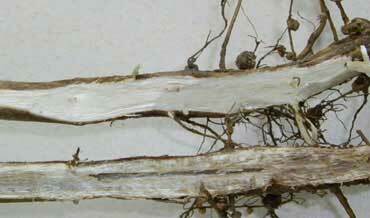 The outer tissue of SDS- infected stems can be rotted, but the stem’s pith remains white. Brown stem rot infection results in a distinct brown center (pith) of the stem, but the roots are not affected. Plants infected with stem canker will develop a brown canker on the main stem. The stems become brittle, but the roots are not affected. If you suspect SDS, send whole infected soybean plants (tops and roots) to a plant disease clinic for identification. 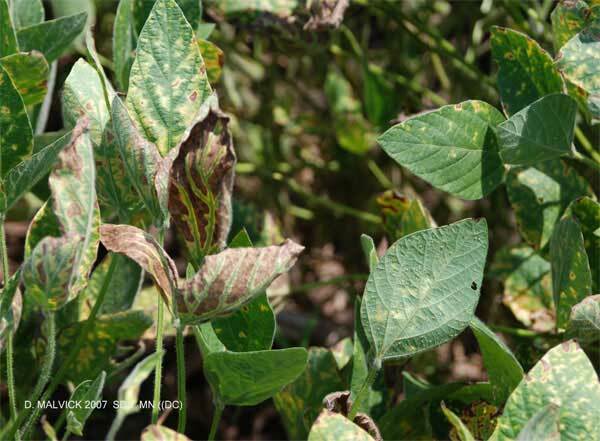 Soybean yield losses from SDS can range from only slight to 100%, depending on variety and stage of crop development when the symptoms first appear. 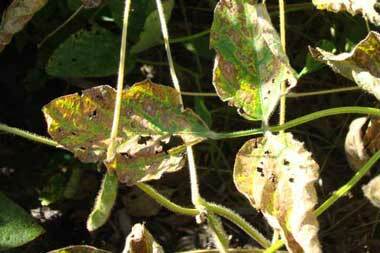 The disease tends to be most severe on well-managed soybeans with a high yield potential. The appearance of SDS symptoms at early pod fill is reportedly more damaging than its appearance at a later stage of plant development. Yield reduction is caused by the reduced photosynthetic area, defoliation, flower and pod abortion, and reduced seed size. 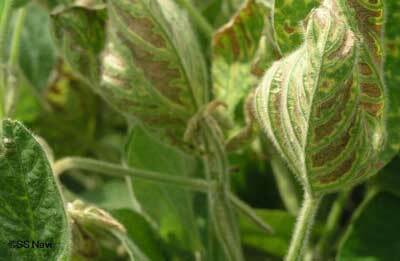 Sudden death syndrome tends to be most severe on well-managed soybeans with a high yield potential. 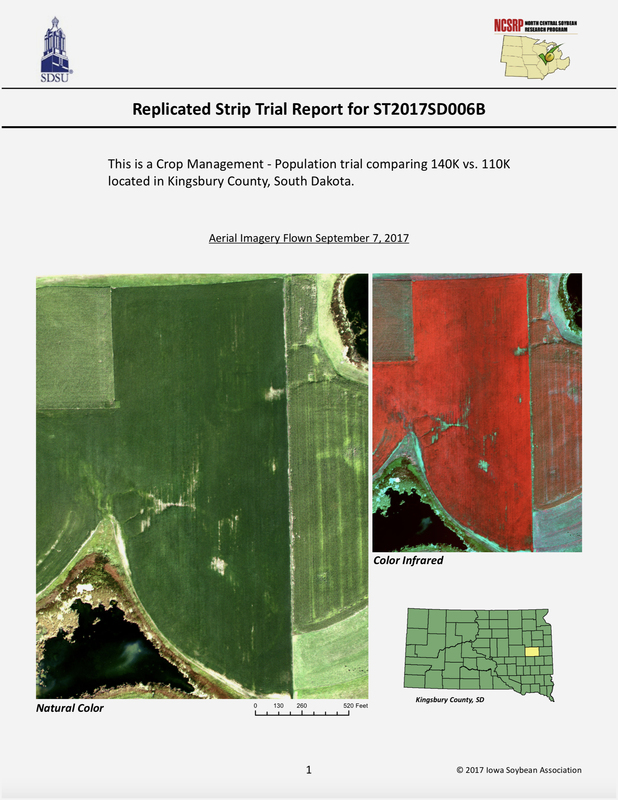 Fields with a history of SDS have a high risk potential. Slow seed germination and emergence, which prolongs the contact period between pathogen and soybean. These conditions are more likely to occur in early planting than later planting dates. Unseasonably cool temperatures prior to or during flowering and pod set. The SDS pathogen spreads from field to field with the movement of soil on equipment, field activity, birds, animals, and wind or water erosion. Although SDS can occur in fields not infested with soybean cyst nematode (SCN), heavy SCN pressure seems to exacerbate SDS. New research suggests that the critical stage for the SDS pathogen to infect soybean plants is before emergence of the germinated seed. Soybeans planted early in cool soil are susceptible to SDS infection when slow germination and emergence prolongs the contact period between pathogen and soybean. Although infection has occured, no symptoms are generally seen until the early reproductive stages. Drawing credit: Westphal, A., T.S. Abney, L.J. Xing and G.E. Shaner. 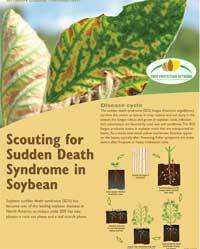 Sudden Death Syndrome of Soybean. 2008. The Plant Health Instructor. American Phytopathological Society. Sudden death syndrome is caused by the soil fungus, Fusarium virguliforme. The fungus is closely related to another soybean pathogen, Fusarium solani form B, that causes seedling disease and root rot. The SDS pathogen produces a toxin that is translocated throughout the plant and interferes with the vascular system of the plant. Sudden yellowing and death of the leaves occurs as the water supply is cut off. Fusarium virguliforme has a blue pigmentation, and a blue coloration is sometimes found on the tap roots of plants that are severely infected with the pathogen. 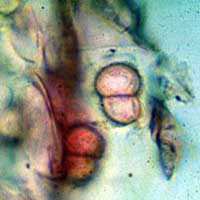 The coloration is due to the large number of conidia (spores) produced on the root surface. 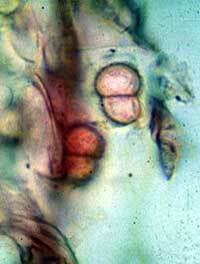 The fungus produces thick-walled survival structures called chlamydospores in soybean root tissue. Chlamydospores can survive for several years in the soil.Chlamydospores can withstand wide fluctuations in soil temperature and moisture. As soil warms in the spring, chlamydospores near soybean roots are stimulated to germinate, and then infect soybean roots. Variety selection is the number one management tool. 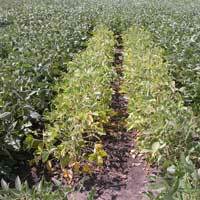 If SDS is causing defoliation in your field, do not plant highly susceptible varieties. Ask your seed dealer for information on varieties with partial resistance or tolerance to SDS. Growers in the southern areas of the region currently have better options when selecting resistant varieties. It's harder to find SDS resistant varieties in the early maturity groups. This is currently a high research priority for soybean breeders. Several universities conduct extensive testing of varietal reaction to SDS. Select varieties with solid agronomics. In many areas resistance to both SDS and SCN is needed. The pathogen prefers cool, wet soil for infection. Move planting dates a week or two after regular early planting dates or till to promote earlier warming of soils. This is easier to do in southern areas of the region than the northern ones, where yield potential may be lost the later a field is planted. 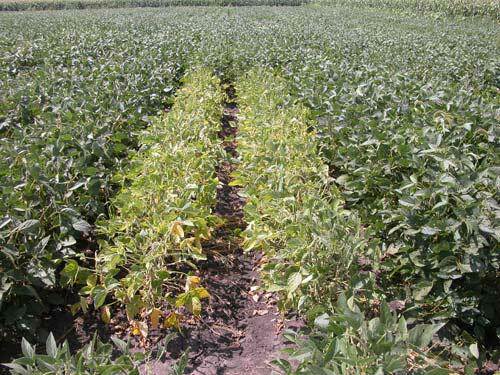 NCSRP researchers recommend to plant early as long as a SDS- tolerant variety is planted, but don’t plant a susceptible variety in a field with a history of SDS. If you have a field with a history of SDS, try to plant it later than other fields. Quality seed has more vigor and germinates and emerges more quickly. Maintain crop fertility based on soil tests. Compaction leads to higher levels of SDS. In some areas, depending on soil type, depth and other factors, ripping or chisel plowing can have a big impact on the amount of SDS that develops. Research shows that corn is a good crop for harboring the SDS pathogen, especially corn kernels. This is consistent with producers’ observations that severe outbreaks of SDS can occur after a few years of continuous corn. A clean corn harvest may help reduce the risk of SDS, while a high amount of harvest loss increases your risk of SDS the next time you plant soybeans. 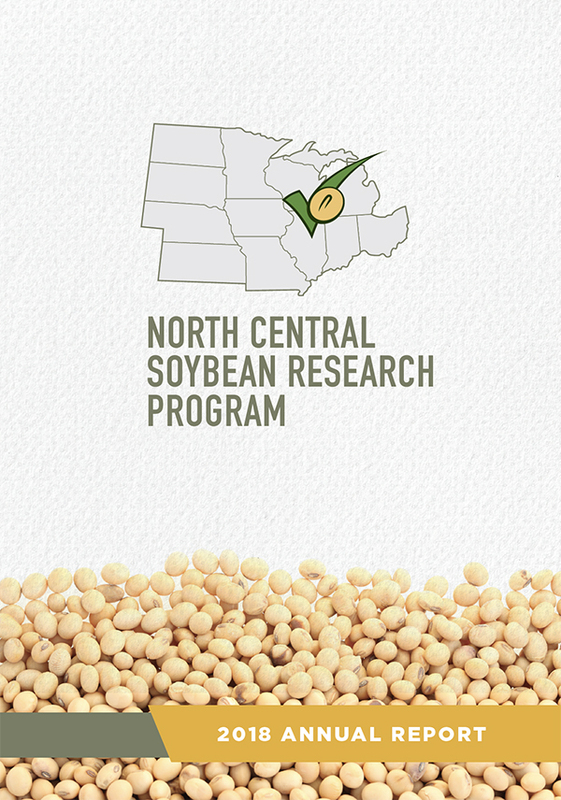 These recommendations are the cooperative effort of soybean researchers and Extension specialists throughout the North Central states, funded with soybean checkoff dollars through the North Central Soybean Research Program.